In this episode, Emily interviews Adriana Sperlea, a PhD student in computational biology at the University of California at Los Angeles (UCLA). Living in Los Angeles is financially challenging to say the least, and Adriana has found ways to improve her cash flow over time, such as by doing a summer internship, moving into subsidized graduate housing, living car-free, and budgeting intensively. She has even recently started contributing to a Roth IRA! Adriana and Emily additionally discuss how Adriana discovered that she owed a large tax bill on her fellowship income and how she paid those back taxes and started paying quarterly estimated tax. Adriana Sperlea is a PhD student at the University of California, Los Angeles. She is studying Bioinformatics through an interdepartmental program. She is an international student from Romania. Her stipend is about $32,500 and she says it goes up a little bit every year. Each month, she receives $2,400. She is in her fifth year of her program. 3:03 How do you live within your means in Los Angeles? Adriana says that getting outside financial support wasn’t an option for her. Her family doesn’t have the means to provide her financial support. As an international student, she doesn’t qualify for subsidized loans. 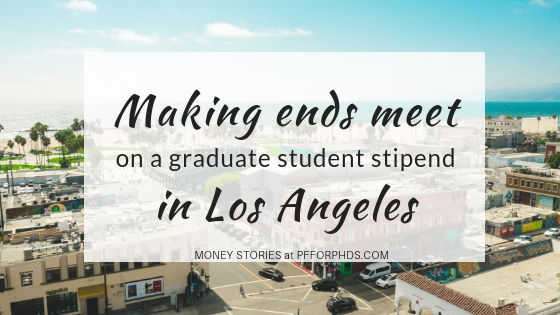 After her third year of graduate school, she had a summer internship that provided an income on top of her graduate stipend. This is the only extra income she has been able to receive outside of her stipend. Due to regulations on visas, international students cannot work side hustles. It is illegal for international students to be employed outside of the university. Emily says that international students are in a tough financial position because they don’t have access to options to loans or side income that U.S. citizen graduate students can access. Adriana was on a training grant that required her to do an internship. It was the Biomedical Big Data training grant. She received pay for her internship and continued receiving her graduate student researcher funding. She lived in San Diego for her internship. San Diego is cheaper than Los Angeles, but she still had to pay her portion of rent for the apartment she shared with her partner in Los Angeles. 6:56 What is your approach to budgeting in Los Angeles? Adriana says that before she created your budget, she had to figure out your housing costs. She lives in graduate student housing, which is subsidized and affordable, but there’s not enough available for all graduate students at UCLA. In Los Angeles, you have to shop around a lot and hustle to make housing costs work with your stipend income. Many people use Craig’s List. Finding housing that costs 30% of your income is not feasible in Los Angeles, but housing that costs 40% of your income could be feasible. Adriana explains that the subsidized housing at UCLA is available through a lottery system. Those who get into the subsidized housing are allowed to stay for seven or eight years, basically as long as needed to complete the graduate program. The leases are month-to-month, so people move out at any time of the year. Adriana says there isn’t enough available, so she pushes for more student housing. She lives in a junior one bedroom, which costs $1,300 per month. She pays $650 for rent because she shares the one bedroom. It helps lower housing costs to share a one bedroom, but for many people this is not an ideal situation. Adriana says that housing and transportation are the two big items for the budget. She doesn’t have a car, but she shares one with her fiancé. She says to find affordable housing, you need to spend time looking for uncommon offers, start early, and have patience. You may need to sacrifice certain amenities and quality, but look for places livable and clean. Ultimately, there is only so much you can do. 13:30 What is the system that you use for budgeting? For her budgeting system, Adriana uses a manual spreadsheet. She inputs her income and monthly fixed payments first. Then she divides the remaining income by four, for four weeks of the month. This sets her variable spending income for each week. Whenever she buys something, she inputs it. She always has a sense of what she spends. She buys groceries on the weekends and cooks her meals, so she doesn’t go out to eat during the week. She doesn’t spend anything Monday through Friday. Often, she has about $100 leftover to use on the weekends for fun. Emily recaps Adriana’s budgeting system. Adriana subtracts her monthly bills from her monthly income. With the remainder, she divides by four for each week. She uses it for groceries first, then doesn’t spend money during the week. She has wiggle room for miscellaneous and money leftover for the weekend. Adriana adds that if she sees something she wants to buy, she puts it on a list. At the end of the month, she looks at her list and ranks the things she wants. This reduces impulse purchases and formalizes the practice of delayed gratification. 17:30 What do you do about large expenses? Adriana has a savings account with $2000 to $3000. She has this savings because her rent decreased since she moved into subsidized housing and she received extra income during her internship. She uses this savings account for big expenses that are necessary, and then she gradually fills it back up. She says that before her internship, it was really tough to make big purchases. For example, she didn’t go home to Romania often because she didn’t have enough for flights. Emily recaps that Adriana got a boost from her summer internship. This helped her get ahead. She repays herself into savings instead of using a credit card. Adriana says she has credit cards for maximizing rewards but she does not spend unless she actually has that money. She has a healthy fear of credit cards. 20:16 Any other comments about your budget or how you make it work in Los Angeles? Adriana has loosened the reigns on herself. She says she has gotten a sense of it after manually managing her budget for so long. Emily says Adriana has internalized her budget. Her budget is in her mind, so she is less dependent on the spreadsheets. Emily says that if you go to a new city, you get thrown. If there’s a big shift in your life that’s a good time to start carefully tracking again. 22:00 Can you talk about saving for retirement? Adriana shares that about one year ago, she asked her fiancé’s dad about investing. Her fiancé’s dad talks a lot about investing, so she asked to learn more. He recommended the book A Random Walk Down Wall Street. Adriana realized that investing is not rocket science and super simple. She thinks there is a weird culture around investing to make it sound more complicated than it is. She says that it’s easy, there’s a low risk way to do it, and during graduate school is the best time to invest. She thought that you have to worry about the market, but she jokes that the best strategy is to forget your password. Adriana uses a Roth IRA. This account pays taxes on her money now. She says this is better because during graduate school, this is the lowest tax bracket that she’ll ever be in. It’s the lowest tax bracket that exists, so this is a good time to invest. She puts $200 in every month. She can budget that now because her rent costs are low. Adriana likes to check in and see she’s accumulated money. Emily writes about investing on her blog and agrees investing is easy. 25:54 Can you tell us the story of your big financial mistake from your second year? When Adriana started graduate school, she was taxed as an international student. As an undergraduate, she went to college in the U.S. She always had taxes withheld and she never had to worry about taxes. But after Adriana started graduate school, Adriana’s residency status changed from non-resident alien to “resident for tax purposes.” This means the U.S. can tax her like she’s a resident. This tax status changed in June of her first year of graduate school, but it was retroactive for the whole calendar year. She had never heard about this issue from anyone else. In June when her status changed, the IRS refunded her about $3,000 that was originally withheld from her. At the time she didn’t fully understand why she received this money, and she spent it. But when April came and she had to do her taxes, she learned that she owed about $3,000 in taxes. It was pretty scary for her. Emily says this tax mistake is pretty common. For the first full calendar year that you’re in graduate school on a fellowship-style stipend, you’re supposed to pay quarterly estimated tax. Most people don’t know about this. 30:28 How did you pay the tax balance? Adriana only had about $1,000 set aside. She feels a bit lucky that she was disputing with the IRS for money that she hadn’t gotten back due to a treaty between Romania and the U.S. that provides for international workers to get their taxes back from first five years from working with non-resident alien status. This dispute got resolved at the same time as her large tax bill. She also applied for a payment plan with the IRS. Anyone can do a payment plan with the IRS if you haven’t done one in past five years and your balance is less than $200,000. Emily says that many people are intimidated by the IRS, but it sounds like Adriana had a good experience. Adriana says she spent a lot of time on hold. But if you’re a graduate student and you realize you can’t pay your tax bill, the IRS is a place to turn to and get a payment plan with no interest. Adriana says budgeting can be tough and time consuming, and a little bit stressful. She says it’s worth it because it’s more stressful to not be able to pay rent. Emily says that it’s better to fess up, face up to reality of the situation, and engage with it. Don’t try to run and hide, because that compounds the problems. It’s common for funded graduate students to be a bit intimidated by preparing their own tax returns, particularly if they are inexperienced in doing so. 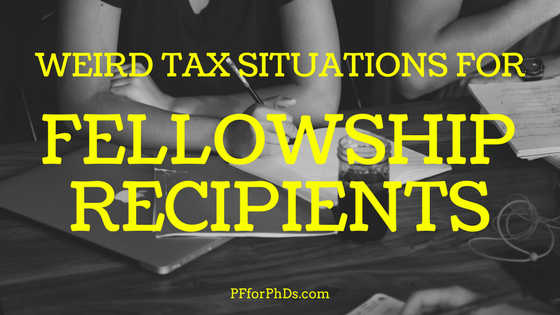 The sources of PhD student funding, namely fellowship stipends and the scholarships that pay tuition and fees, are rather unusual, so most people and even most professional tax preparers don’t have any experience with them. The strategies that apply for undergraduate-level taxes are pretty different from those that apply for graduate-level taxes. 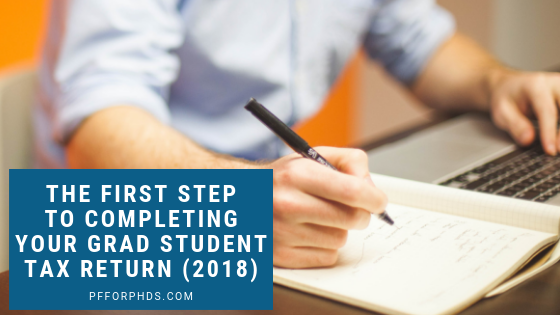 But learning how to prepare your grad student tax return isn’t actually difficult, nor are the resulting steps complicated. There’s no reason to be intimidated! 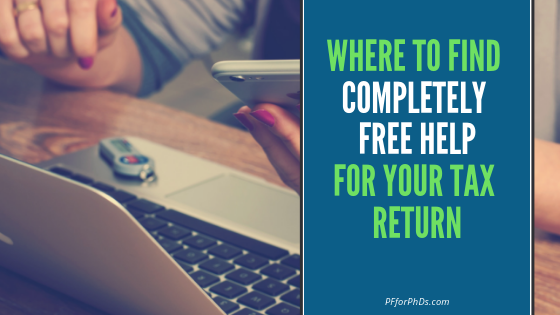 This post covers the essential points you need to know to prepare your grad student tax return, whether you do it manually, with tax software, or with the help of another person. This post is for tax year 2018. This post only covers federal tax due for domestic graduate students in the United States; you may have additional state and local tax due. I am detailing only the aspects of preparing your grad student tax return that are specific to higher education; I am not covering more general tax information that applies to the population at large. 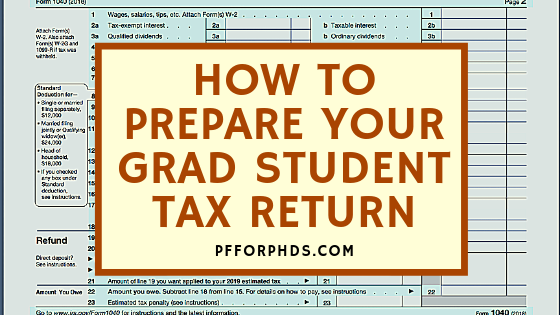 This post is a step-by-step guide on how to prepare your grad student tax return. I want to clear up some confusion right up front so that you can work your way through the guide without becoming sidetracked. All of your income is potentially taxable. The purpose of your tax return is to show that you don’t have to pay tax on all of it. What graduate students don’t often realize is that they have income sources aside from the one(s) that hit their bank accounts or are reported on official tax documents, and they need to deal with those incomes on their tax returns. You have your stipend/salary that serves as your take-home pay, and this is potentially taxable, even if you don’t receive an official tax form about it and you didn’t have any taxes withheld. In fact, I’ll say you’re very likely to end up owing tax on it unless it’s quite low and/or you have a lot of tax deductions/credits. You also have another kind of income if you are funded: the money that pays your tuition and fees. Your university might refer to this as scholarship, tuition waivers, tuition remissions, etc. Even if this money never passes through your personal bank account, it does pass through your name via your student account, and it also is potentially taxable. There is a very high chance you can use an education tax benefit to reduce your taxable income and/or reduce your tax due, but you have to sit down and do the arithmetic on it, not just assume that you won’t owe any tax on it. (In fact, doing the arithmetic may very well help you pay even less tax than if you ignored it!) This guide shows you exactly how to do that. The first step to prepare your grad student tax return, and any tax return, is to collect all your income sources. These income sources include wages as well as non-wage income such as interest and investment income and self-employment income, but does not include loan disbursements. Your TA/RA pay will be reported to you on a W-2. Your fellowship stipend or training grant income may be reported to you on a 1098-T in Box 5, on a 1099-MISC in Box 3, on a courtesy letter, or not at all. If your university does not send you any documentation of your fellowship income for 2018, you have to sum all the payments you received to figure out what it was. Your scholarship/grant income (i.e., the money that paid your tuition and fees), may be reported to you on a 1098-T in Box 5 or not at all. If you did not receive a 1098-T from your university, you should look at the transactions in your student account (e.g., Bursar’s account, Cashier’s account) to see the money posted there on your behalf. Your university may not use the exact terminology that I did, but the tax forms and documentation (or lack thereof) will help you differentiate among the three types. At this stage, you may be thinking that the total of all this income is way too high. There’s no way you want to pay tax on all this income! Stick with me: We are going to reduce either your taxable income or your tax due in a subsequent step. But for now, work with all of your incomes. Your grad student income (assistantship pay, fellowships, and scholarships/grants) falls into two broad categories: compensatory and non-compensatory income. Compensatory income is easy to define, as you will receive a W-2 for it. (This rule is with respect to your three sources of grad student income only; other types of income could be compensatory but not associated with a W-2, such as self-employment income.) Non-compensatory income is best defined as any grad student-related income that is not compensatory (reported somewhere other than a W-2 or not reported). 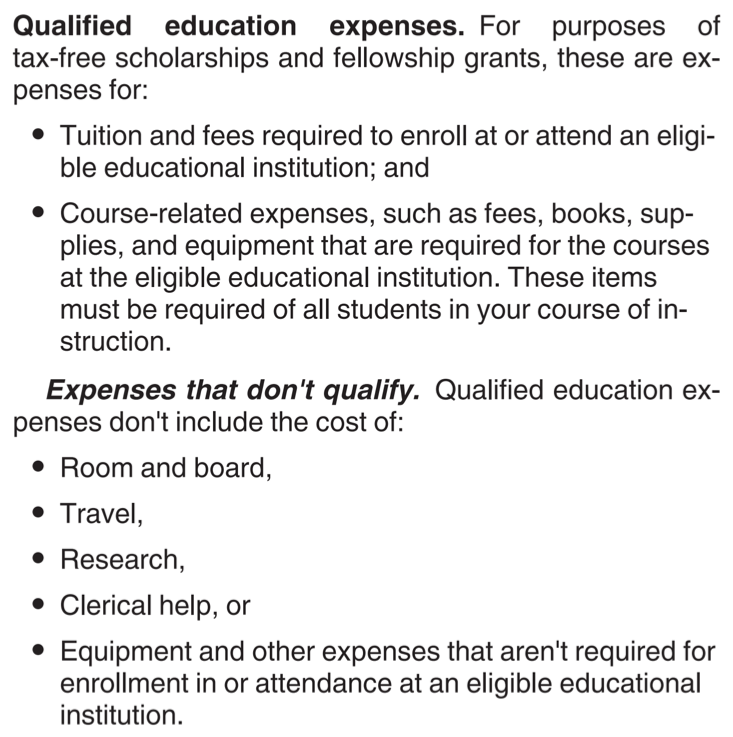 According to the IRS, it is “various types of educational assistance you may receive if you are studying, teaching, or researching in the United States… scholarships, fellowship grants, need-based education grants, qualified tuition reductions” (Publication 970 p. 5), but the way the IRS uses those terms doesn’t completely match how we use the terms in academia. For tax year 2018, there are two relevant education tax benefits that you can access to reduce your tax burden: making non-compensatory pay tax-free and the Lifetime Learning Credit. You use your qualified education expenses (QEEs) to take a deduction (by either making your non-compensatory pay tax-free) or take a credit (by taking the Lifetime Learning Credit). A tax deduction reduces your taxable income, while a tax credit reduces your tax due directly. You can apply either one or both of these benefits, but you have to use different QEE dollars. The definition of a QEE changes slightly for each tax benefit. Tuition at an eligible education institution is a QEE for both tax benefits (although to make non-compensatory pay tax-free you have to be a degree candidate). “Required fees” are QEEs for making non-compensatory pay tax-free. 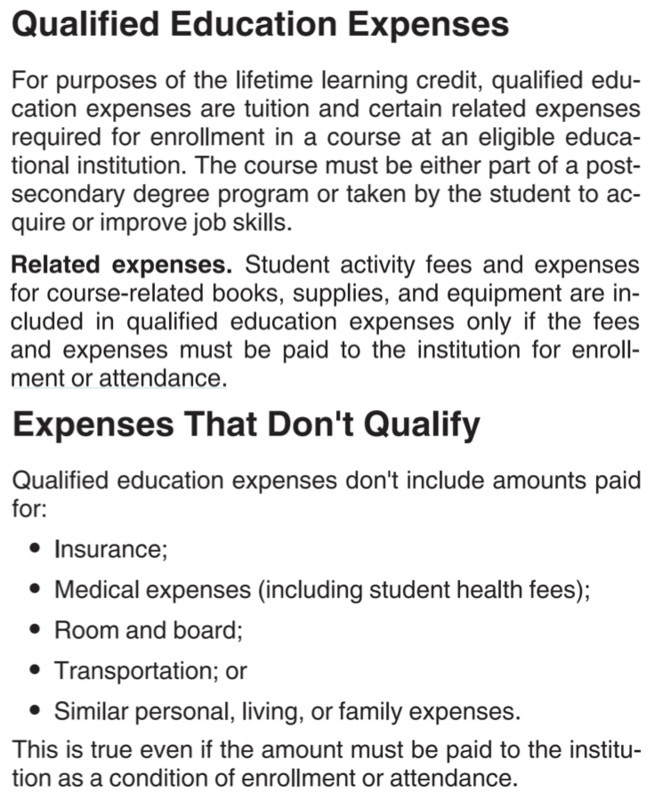 The Lifetime Learning Credit uses the wording “the fees and expenses [that] must be paid to the institution for enrollment or attendance” to define a QEE. Other fees and expenses beyond tuition may be QEEs; you should refer to the definition of a QEE with respect to each benefit. If you received a 1098-T from your university, Box 1 will contain the sum of the QEEs that were processed by the office at your university that prepared the form. You may have additional QEEs not reported on a 1098-T. Between 2017 and 2018, the IRS updated the 1098-T, and some universities had to change their accounting system. If Box 3 on your 1098-T is checked in 2018, it is possible that some of your QEEs are double-counted in both 2017 and 2018. So instead of running with the value in your 1098-T Box 1, you should figure out if any of the QEEs included were already used in 2017. Whether you received a 1098-T or not, you should examine the transactions in your student account to make the final determination about the qualified education expenses that were processed by that office. You may have additional QEEs not reported on your 1098-T or in your student account, such as required course-related expenses (keep your receipts!). The non-compensatory pay that you receive can directly cancel against your QEEs to become tax-free. For example, if the tuition that you are charged and the scholarship or tuition reduction that pays it are exactly the same amount, they net to zero and you won’t be taxed on that portion of your non-compensatory pay. In fact, you don’t even have to show the IRS this calculation; you only have to report the portion of your non-compensatory pay that exceeds your QEEs. The Lifetime Learning Credit reduces your tax burden and may be beneficial to apply if 1) your QEEs exceed your non-compensatory pay and/or 2) a 20% credit is more valuable to you than a deduction. The Lifetime Learning Credit is a 20% credit; that means that if you use $1,000 in QEE expenses for the Lifetime Learning Credit, your tax due will be reduced by $200. There is a $10,000 limit on QEEs that can be used for the Lifetime Learning Credit, so the maximum benefit is $2,000 even if you have additional QEEs. The modified adjust gross income phase-out for this deduction begins at $56,000 for a single person and $112,000 for a married couple filing jointly. If you take the Lifetime Learning Credit, you must fill out and file Form 8863. Do you remember how on multiple choice tests you are instructed to choose the “best” answer, not necessary the (one and only) “correct” answer? 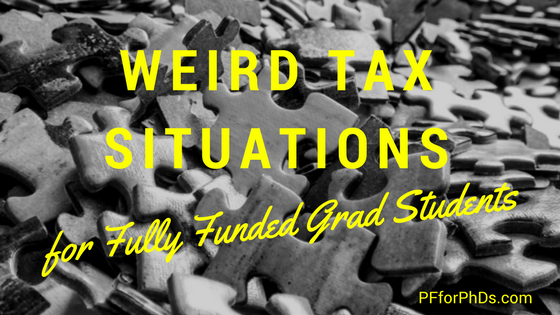 There are multiple acceptable ways to prepare your grad student tax return. At the end of the day, you can figure out the “best” answer – the one that results in the lowest tax burden for you – but it may very well take calculating your tax due with each of the different approaches. I do think it’s worth delving into the details of this decision, because may be possible to reduce your tax liability by as much as $800! This section assumes that you are eligible for both of the education tax benefits (based on your income, the status of your educational institution, your student status, etc. ); if you are ineligible for one or the other, that makes the decision all the easier. Please note that if you elect to apply the Lifetime Learning Credit when you could have made a scholarship tax-free using a matched QEE, that scholarship (by its terms) has to be eligible to be applied to a non-QEE. If a scholarship, for example, is earmarked only for paying a QEE such as tuition, then you must use your tuition QEE to make it tax-free; the scholarship cannot be included in taxable income and the QEE used for the Lifetime Learning Credit. Essentially, you will choose which education tax benefit to apply first, tax-free scholarships and fellowships or the Lifetime Learning Credit. The one you apply first should be whichever minimizes your tax liability. As tax-free scholarships and fellowships is a tax deduction, it is “worth” the amount of your QEEs or non-compensatory income (whichever is lower) multiplied by the sum of your federal, state, and local marginal income tax brackets. As the Lifetime Learning Credit is a credit, it is worth its face value, which is 20% of the QEEs you apply to it up to $10,000. Ask yourself if the sum of your marginal tax brackets is more or less than 20%. If the sum is greater than 20%, that indicates you should apply your QEEs first to make as much of your non-compensatory pay tax-free as possible. If you have any remaining QEEs, apply them to the Lifetime Learning Credit (up to $10,000 of QEEs). If the sum is less than 20%, that indicates you should apply your QEEs first to the Lifetime Learning Credit (up to $10,000 of QEEs). If you have any remaining QEEs, use them to make as much of your non-compensatory pay tax-free as possible. When in doubt, calculate your tax due under both methods (or use software). In some situations, the above rule of thumb will not indicate the correct method to minimize your tax burden. For example, with the Lifetime Learning Credit-first method, you report a higher income than you would have if you used the tax-free scholarships and fellowships method, which might make you ineligible for certain tax benefits on other parts of your return, e.g., the Earned Income Credit. It’s imperative to calculate not just your total federal tax due under each method but your state and local tax due as well. Not all states treat scholarships and fellowships as ordinary income, for example. the amount of your Lifetime Learning Credit (maximum $2,000) from Form 8863. With respect to your (net) grad student income, Lifetime Learning Credit, and tax already paid, how to report them on your tax return is very straightforward. Of course, you will fill out the rest of your tax return by following the form instructions; this section only relates to the grad student aspects of your return. On Form 1040, you will write your income in Line 1. If your grad student income includes any non-compensatory income, write “SCH” in the line next to the number. You may also include the amount of the net non-compensatory pay. The purpose of this note is to alert the IRS that there is no W-2 associated with all or part of the income reported on that line. Report your Lifetime Learning Credit on Line 50 of Form 1040 Schedule 3; you will also file Form 8863. The amount of this credit will directly reduce your tax due. If you received a W-2 and/or 1099-MISC for part or all of your grad student income, you will enter the amount of federal tax that was withheld from your income in Line 16 of Form 1040. If you paid quarterly estimated tax on your fellowship income, report the total of the estimated tax payments you made in Line 66 of Form 1040 Schedule 5. I have omitted from detailed discussion one education tax benefit that you may be familiar with from past experience preparing your tax return. The American Opportunity Credit is typically used during the undergraduate years only. It can be claimed in only 4 tax years and not in any tax year after the one in which you finish your first four years of postsecondary education. Therefore, if you graduated from college in 2018 (in four years) and you (or your parents) claimed the American Opportunity Credit in no more than 3 previous tax years (e.g., freshman spring/sophomore fall, sophomore spring/junior fall, and junior spring/senior fall but not freshman fall), you may be eligible to claim it in 2018. If you claim the American Opportunity Credit, you cannot use the Lifetime Learning Credit. If you are considered a dependent on your parents’ tax return in 2018, you cannot claim the credit. Best of luck to you as you prepare your grad student tax return this year! If you need additional support, download my tax “cheat sheet” and/or register for my workshop (includes live Q&As!). And please consider sharing this post with your peers through social media or a list-serv! We at Personal Finance for PhDs are not professional tax preparers; this post is for informational purposes only and does not constitute tax advice.